The chopper had been hired for “keeping an alert vision and effective surveillance” in Meerut and adjoining districts. 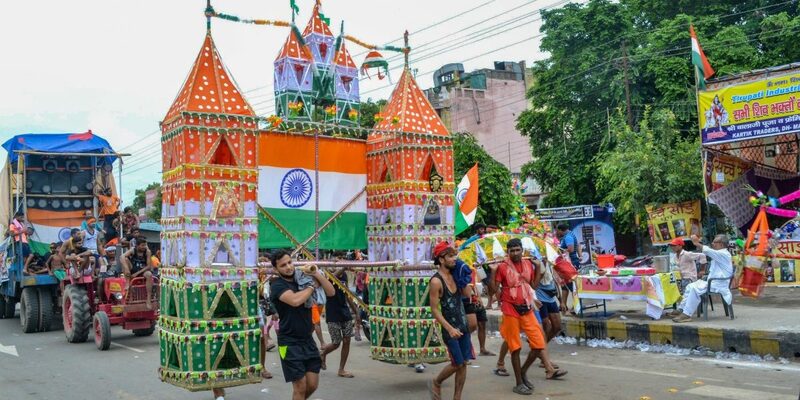 New Delhi: After getting fig trees pruned along the route of the Kanwar Yatra last year, the Adityanath-led Uttar Pradesh government has stepped up efforts to welcome Kanwariyas – who have been in the news for vandalism and instilling fear among Bareilly’s Muslims . The state has reportedly spent upwards of Rs 14 lakh on the chopper from which police officials showered rose petals on the Kanwariyas. According to an Economic Times report, on August 5, the state approved hiring a chopper for “keeping an alert vision and effective surveillance” in Meerut and adjoining districts from August 7-9. Such air surveillance of the yatra is being done for the first time. It came after an order from chief minister Adityanath during a detailed review meeting on July 18. The state home department’s order, however, did not mandate showering flower petals on the devotees. “It is a sign that government and administration is welcoming the Kanwar yatris – it is a symbolic gesture. It does not mean police are succumbing to religious propensities of the person walking on the road,” Kumar said, adding that the police wanted to convey the message that they were “acting as a facilitator, and not as a regulator” of the yatra. “Showering petals is not a violation of conduct rules. There is no immorality and we do similar acts for all religions,” Kumar said. This at a time when videos have surfaced of the so-called Shiva devotees vandalising a car in west Delhi. The car’s occupants fled the scene, fearing for their lives and even refused to give any complaint in writing. Police yesterday arrested a 26-year-old man in connection with the incident. After violence during last year’s yatra injured dozens, police this time issued “red cards” to 250 individuals in Khelum village of Bareilly who “may cause trouble”. About 70 Muslim families left the village fearing they will be falsely implicated.